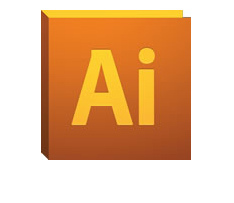 Did you know that many Inkd graphic design templates originate in Adobe Illustrator? For marketing collateral with only a few pages, or just a front and back, Adobe Illustrator Templates are a perfect solution! Inkd brochure, newsletter, flyer and other popular templates are often created in Adobe Illustrator. Even if they weren’t, odds are that vector and graphics images used in our print templates were, at some point, crafted in this legendary software application. Professional graphic designers have been making brochures, business cards and other marketing materials for years in Adobe Illustrator because there is no other vector graphics software with this much flexibility, power and control. Primarily a graphics software program, Adobe Illustrator is actually often used for page layout. In fact, many graphic designers are using this drawing program to create artistic layouts such as business cards, ads, posters, and postcards. Adobe offers many tips and tutorials on using Illustrator for print and template creation and provides built-in tools for working with text, fonts and advanced print and publishing capability. Starting with an Adobe Illustrator template from Inkd makes it even easier! Need Help Customizing a Design? Don't see what you're looking for? Need design support? We're here to help!